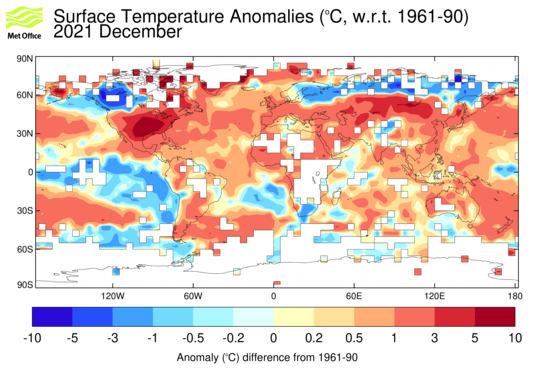 How do we know the world has warmed? EN3, HadCRUT3, CRUTEM3, HadSST2, GISST, MOHSST, MOHMAT, HadSLP1, and HadRT are now obsolete and have been moved to a deprecated datasets page. They are retained solely for the purpose of comparison to the current datasets. Researchers at the Met Office Hadley Centre produce and maintain a range of gridded datasets of meteorological variables for use in climate monitoring and climate modelling. This site provides access to these datasets for bona fide scientific research and personal usage only. Please note that this is not an operational service. This site is run by research staff with the primary aim of improving collaboration with fellow researchers. Everyone is welcome to use the site, and we aim to make it reliable, but it does not have the same level of support as the official Met Office web site. Hadley Centre climate model data is distributed through the British Atmospheric Data Centre. Some climate model runs are also available on the WCRP CMIP3 Multi-model data archive. Please consider the use of these data resources in your work, if appropriate. The Hadley Centre collaborates with UKCIP on modelled and observed datasets. This site is hosted by the Met Office and so its use is subject to terms and conditions. Data sets within the site may also have their own terms and conditions detailed in their pages.